fountain pen oddity: can you help? [Update: this pen has now found a new owner]. This Mont Blanc Solitaire fountain pen is possibly an oddity – you’ll see why in a moment or two. But one quick note first… this writing instrument is not ours, but we would like to help a good customer value it, find out how rare it is (or otherwise) and, if appropriate, possibly find a loving home for it. It is possibly an oddity… so please read on and email us if you know any interesting or relevant information. Thank you in advance! “About 15 years ago I did some work for Dunhill, who I believe owned the Mont Blanc brand. The pen was part of a consignment sent to the States and returned when it was discovered that the nib was 14 carat gold and not 18 carat. So, there you have it. Can you help? Questions which immediately spring to mind are…..
How on earth did this ‘error’ with the nib occur – if it is an error? Is it worth more – or less – because the nib is 14 carat gold, not 18 carat gold? Is there a collector out there who would just love to add it to his/her collection? And the million dollar question…. what would a fair market value be? The fountain pen is, in effect, ‘new old stock’ but I’ll expand that description a little more. The owner says that it has never been used (that’s quite evident on inspection, as is the fact that it has never had ink put into it). It even has the original “Made in W. Germany” and “M” stickers on the barrel (see photos). The original leaflets are still under the pen tray of the presentation case. International Guarantee/Instruction booklet, as new – gold foil and brown cover, interior in black and white with diagrams etc. Clearly the guarantee is no longer valid. Mont Blanc Guarantee card/4 page booklet, as new – litho gold cover with blind embossed logo and black text to reverse and interior. Again, clearly the warranty is now out of date. This card had never been filled in. Black and white folded leaflet – “Mont Blanc.. instructions for filling.. for converter use.. for continuous use…Exclusive Montblanc Representative in the U.S. and Canada… KOH-I-NOOR RAPIDOGRAPH, INC. Bloomsbury, New Jersey 08804” address and blurb. As new. The presentation case (with its beige suede effect exterior and brown velvet effect interior) is in ‘new‘ condition having always been stored in the original outer cardboard carton. 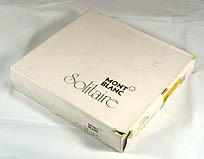 Mont Blanc Solitaire ‘logo’ litho printed on the front and four other sides. Hand-written “19” on the top side. “144G M” (hand-written faintly in pencil – I think that’s what it says). Going back to the pen, it’s probably best just to look at the photos, however here’s a little more detail which you won’t be able to see on the photos. The nib reads “4810… M…14K… MONTBLANC” on the gold part itself, while behind the black nib-holder is a stamped “1”. The cap/lid, by the way, is a push-fit and I’d guess you’d call the pattern on the barrel/cap a ‘guilloche’ pattern? On the lid/cap, however, there is a strip which doesn’t have that pattern and I guess that’s where you might engrave the implement if you so desired. The open end of the cap/lid also has MEISTERSTUCK – MONTBLANC engraved around it and at the opposite end, the top has a black and white domed Mont Blanc star. The clip has GERMANY engraved on it at the back where it attaches to the cap/lid. I’m assuming, at an original retail price of $450 (c. 15 years ago) that the barrel and lid are gold of some sort – but from initial feedback on pen forums, it’s sounding increasingly likely that this is gold plated rather than solid. While I cannot say for sure that the base metal under the gold is silver, it certainly is silver in colour if you look inside the lid (rather than a brass colour) – unless this is just some kind of metal liner. Conversely, if you look at the tiny bit of visible interior to the barrel, that does look gold or brass coloured rather than a silver colour. Confusing to a non expert! I have tried to find marks like carat marks or numbers etc., for example around the lip of the cap (as suggested by a kind forum member) but cannot see such a thing, even with my loupe. E&OE. Please note that we are featuring this pen as a favour to our customer and therefore we have no control over the accuracy of the information which we have been supplied. We have supplied details in good faith and no warranty, express or implied, is given nor is intended. Thanks to everyone who has, so far, responded to my various forum posts about this pen – your input is very much appreciated. 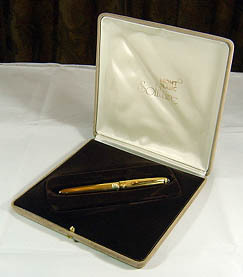 The general consensus is that the pen is not a vermeil version (there are no visible hallmarks on the lid, including 14k, 18k, a squirrel, a lady’s head and 975). It is thought to be a gold plate on brass version (or if you want to get technical, the brass is nickel plated before the gold goes on, apparently!). The owner has now had a couple of offers and one states that this is a “gold-plated on brass 144 made in the 90s” (although see other info two paragraphs down for other comment on the age). We have also learnt that the finish on the barrel and lid may be called a ‘barley’ finish – which is apparently more desirable than some of the more recent Mont Blanc pens because the texture of the barley finish does not show fingerprints so readily as some of the more modern, smoother, finishes. 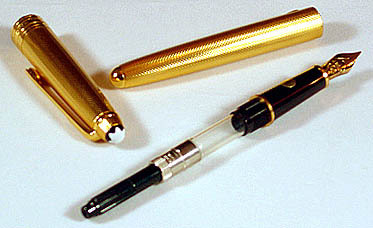 With regard to age, we have been told by one kind chap on a pen forum that it was sold in Europe primarily in the 80’s. This is backed up further by another forum poster who says that if the box is, in fact, the original box (we have no reason to think otherwise), it would date the pen somewhat earlier than 1992. So, the two opinions tie together. One area we are getting conflicting advice on is that of potential value. So far, we have had valuation suggestions ranging from $125 at the most pessimistic, to $650 at the most optimistic. On several occasions, however, the suggested valuations have come in at around the $400 and $450 mark – which makes sense if you treat this as NOS (new old stock) – see original price tag. This price bracket does start to look like the best shot. We have, today, received an offer of $380 USD and are pleased to confirm that the owner has accepted it and the transaction is now complete. Thanks to everyone who helped with thoughts and information about this Mont Blanc pen.